During the early 19th century, muzzle-loading flintlock muskets were the weapon of choice for the infantry. These firearms were crafted long, so even when three ranks deep there was no danger of shooting a cohort in the back, and could be fixed with bayonets for close combat, again taking the length advantage into consideration. (They originally took the place of pikes on the battlefield.) The percussion cap started replacing flints through the 1830s. Accuracy wasn’t an issue with these smooth bore weapons, because they were fired en masse, and the black powder smoke obscured the target. However, rifles* were gaining popularity, first for hunting, then in the hands of specialized sharpshooters for warfare, displaying effective results during the Seven Years’ War (1756-63) and American Revolution (1775-83), then in rifle companies and skirmishers throughout the Napoleonic Wars (1803-15). These early rifles still muzzle-loaded, were slower to reload, and required cleaning more often, but provided much greater range and accuracy. There were many manufacturers, most nations producing their own weapons. Let us start by examining one of the most common models. The Pattern 1853 Enfield (P53) rifle was manufactured by the Royal Small Arms Factory from 1853 to 1867, with approximately 1.5 million being produced. It saw service all over the world, but most famously in the Crimean War, the Indian Mutiny, and on both sides of the American Civil War. It had an adjustable ladder rear sight made with steps for 100 yards (known as the “battle sight”) range, and for 100 yard increments up to 400 yards. For distances farther than that, an adjustable flip-up blade sight was graduated from 900 yards to 1,250 yards. The official maximum range was 2,000 yards, but later trials revealed it was only effective to 1,450. British soldiers were trained to hit a target 6 feet by 2 feet with a 2 feet diameter bull’s eye. The target used from 650 yards to 900 yards had a 3 feet bull’s eye, with any man scoring 7 points with 20 rounds at that range being designated a marksman; hitting the target was worth a point, hitting the bull’s eye two points. Several Minié style bullets, and a smooth bore round on the left. The Leichte Perscussions-Gewehr (Light percussion gun) Model 1841. Meanwhile, in the USA, several inventors were creating some innovative designs. One of the best and most famous was patented in 1849 by Christian Sharps (1810-74), a gunsmith who learned his trade as an apprentice and worked at the Harpers Ferry Arsenal. His Model 1849 was the first American breech-loader to be widely accepted as safe and reliable. His Model 1851 received orders from the US government, first for 5,000 carbines (short rifles for cavalry), then for 15,000 rifles. Over 100,000 variants of model years were produced and used extensively in the American Civil War. The weapons fired a .52 calibre bullet, with a 1,200 feet per second muzzle velocity, had an effective range of 500 yards, and a maximum range of 1,000 yards. Originally loaded with a paper cartridge, it was one of the few designs that successfully transitioned to metallic cartridge (where the round, charge, and percussion cap is produced as a sealed unit) in the 1870s. The sights were an open ladder type adjustable for distance. An excellent all around rifle, but still not capable of the long kills. Whitworth rifle circa 1860 with side mounted scope. The truly long shots were achieved through purpose built rifles with greater muzzle velocities and specialized sites. The Whitworth rifle is one of the better known models. Sir Joseph Whitworth (1803-87), was an English engineer, entrepreneur, inventor and philanthropist, who was created a baronet for his work. Starting in 1857 his company produced a .45 calibre muzzle-loaded percussion lock with a hexagon barrel that could consistently hit a target from 2,000 yards! The British army rejected it due to the slow loading (2 rounds per minute), tendency to foul, and the unique ammunition; a twisted hexagon of lead alloy which made a shrill whistling noise in flight. However, the Whitworth Rifle Company sold their product to the French army and the American Confederacy, and it saw use by Union marksmen as well. 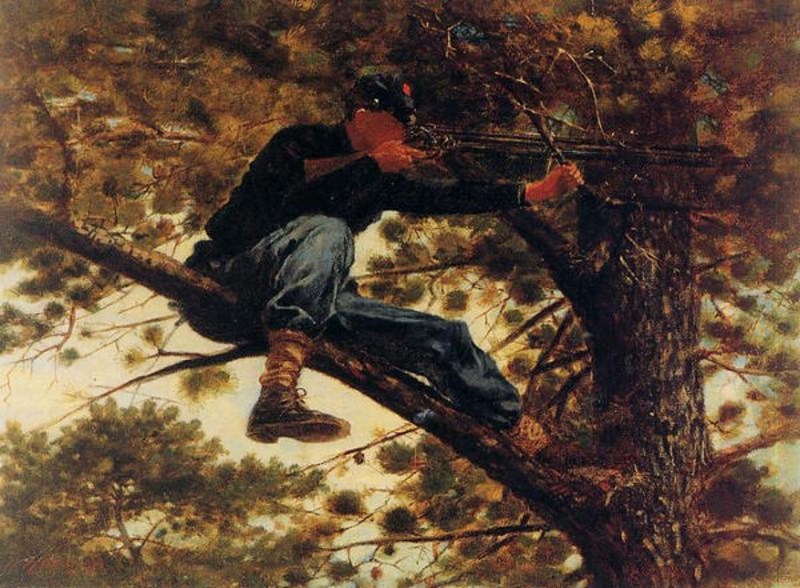 Sharpshooter, 1863, by Winslow Homer (1836-1910). Rifle scopes were made by many craftsmen, but William Malcolm is somewhat legendary. He produced telescopic versions in 1855 with between 3X and 20X power, that were considered superior to any other model for many years. He had worked for a telescope maker and learned optical principles, how to grind lenses, precise adjustments, and to fabricate the tubes to house lenses. He was also the first to use achromatic lenses, which limit colour refraction within an eyepiece, providing better definition of the target, a flatter field of view. American target rifle, circa 1865. Slow to load and heavy. Sharpshooters would “over charge” their weapons, adding more powder than for a normal shot. This proved dangerous, possibly resulting in a shattered weapon. There were many who experimented with guncotton (nitrocellulose), which provided six times the gas generation over an equal measure of black powder, and produced very little smoke, but was unstable and caused catastrophic explosions. Open sights were no longer adequate due to the distances achieved, so telescopes were adopted to provide a clear view. By the mid 1800’s the “sniper” rifle had been developed, first for hunting, then for warfare, being used to devastating effect ever since. If you would like to view more rifles, including some unique revolving chambered models, please visit the Kate’s weapons board on Pinterest. Note: The private purchase rifles made by gunsmiths for wealthy customers were far superior to the mass produced and somewhat crude military models. *Rifled barrels were first appeared in Europe in the 16th century, and were very difficult and expensive to produce, so this innovation remained a privilege of the wealthy, enhancing their hunting and target shooting hobbies. Awesome. The birth of snipers. I’m a reenactor, and I never knew that about long muskets. It makes perfect sense. You have a lot of neat little tidbits in your articles I haven’t seen anywhere else. Thanks. Good one, but I’d like to add the Lorenz Rifle (Austrian) was used in large numbers during the 1860s. Thanks. I hope you will do a follow up piece on hand guns. 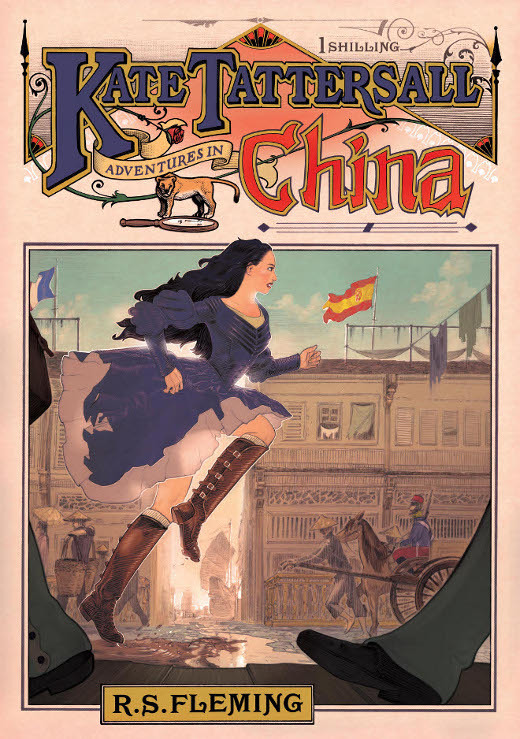 I am currently playing a female character in a Space 1889 campaign. She has a Webley/Wilkinson 455 calibre, which I would love to know more about. @ Laurie, there are previous articles on here covering handguns, but nothing about the Webley .455, which wasn’t crafted in 1887. I’ll send you a note with a link to information. See my web site or even better read my book for more info. Great post. I am impressed! Very useful info. I’ve truly enjoyed browsing your blog. The clothes are best, but you make weapons interesting too! Nice post, especially in regard to the civilian sniper rifle of 1863.